In the previous Halachot we have explained that one of the thirty-nine forbidden works on Shabbat is “grinding.” After discussing the fundamental points of this prohibition, let us now discuss some related laws. In the previous Halacha we have explained that it is permissible to mash an avocado on Shabbat using the prongs of a fork as long as one does so with the intention of eating the avocado immediately (within a half-hour). The question is: Is it permissible to spread the avocado on a slice of bread or is this included in the prohibition of “smearing” on Shabbat? 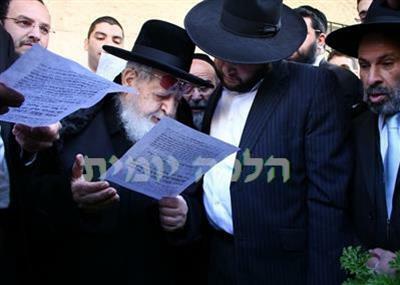 Maran Rabbeinu Ovadia Yosef zt”l deals with this matter lengthily in his work and rules that this this is not forbidden, for the prohibition of smearing does not apply to food items in addition to other reasons. Thus, halachically speaking, it is permissible to spread avocado on a slice of bread on Shabbat (Chazon Ovadia-Shabbat, Part 4, page 264). We have written above that it is permissible to cut up a salad on Shabbat, even finely, when one intends to eat the salad immediately, i.e. within a half-hour. The question becomes: Does the same apply to meat or cheese in that one may only slice them finely if one intends to eat them immediately? The Sefer Terumat Ha’Deshen (authored by Rabbeinu Yisrael Isserlan, one of the great Rishonim) writes that one may cut one meat finely on Shabbat even if one intends to eat it one only intends to eat it two or three hours later, for the prohibition of grinding only applies to things that grow from the ground, such as wheat, barley, spices, fruits, and vegetables. The prohibition of grinding does not, however, apply to meat which does not grow from the ground. It is therefore permissible to cut meat very finely on Shabbat as long as the meat will be eaten sometime on Shabbat. Even if one does so at night with the intention of eating it on Shabbat morning, this is permitted (ibid. page 267). Is it permissible to grate cheese using a grater on Shabbat when one has in mind to eat the cheese immediately? We have already explained that even when one has in mind to eat what one grinds immediately, one may only do so without the means of a utensil designated for this purpose. A grater is certainly a utensil designated for grinding. It is therefore absolutely forbidden to grate cheese on Shabbat using a grater even when one plans on eating it immediately as this is similar to grinding spices using a mortar and pestle which is forbidden even for immediate use (ibid page 268). Is it permissible to crumble bread on Shabbat? The Rama (Chapter 321) writes that it is permissible to crumble bread before chickens on Shabbat. The reason for this is brought in the Sefer Yere’im which states that since the bread was once in crumb-form when it was still flour, although it was stuck together once again by kneading and baking it, there is nevertheless no prohibition to crumble it on Shabbat, for there is no prohibition to grind something which has already been ground. It is therefore permissible to crumble bread by hand on Shabbat as long as this is done for the purpose of Shabbat. As we have written, slicing vegetables is included in the prohibition of grinding and is only permissible when one slices the vegetables in order to eat them immediately. The same applies to slicing vegetables for animals which is only permissible when one is cutting them in order for the animals to eat them immediately. Although there are those who rule stringently regarding this law on the basis that slicing vegetables on Shabbat is only permissible when this is being done for human consumption, nevertheless, Maran zt”l proves (ibid. page 270) that the letter of the law permits this even when this is being done for animals. It is likewise permissible to cut meat into pieces in order to feed a dog.